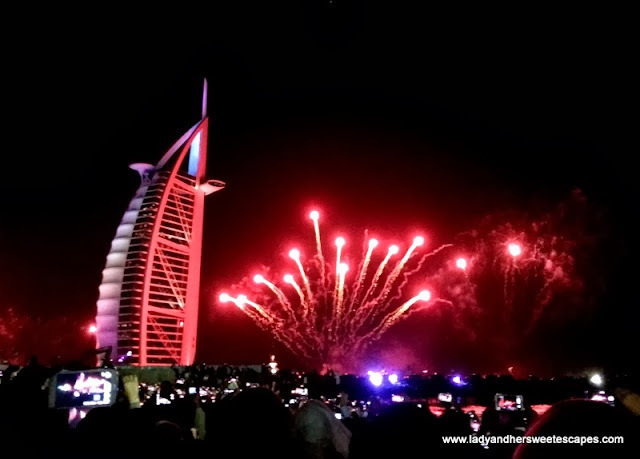 My 2014 began with a bang, under a night sky lighted with 400,000 fireworks that is now known to be Guinness World Record's largest pyrotechnic display!!! The record-breaking fireworks display was the best and the brightest I've ever seen so far. The fireworks went off from one iconic structure to another, with long gaps that actually made people think that there's a major glitch with the highly anticipated largest fireworks show in the world! Burj Khalifa started the celebration promptly, while we stood there miles away wondering what happened to Burj Al Arab's and The Palm's much-talked about fireworks display. A few minutes past midnight, when the pyrotechnics show was over at the world's tallest man-made structure, the annual fireworks extravaganza of Burj Al Arab started. It wasn't in sync with our loud countdown, but it was all worth the wait! 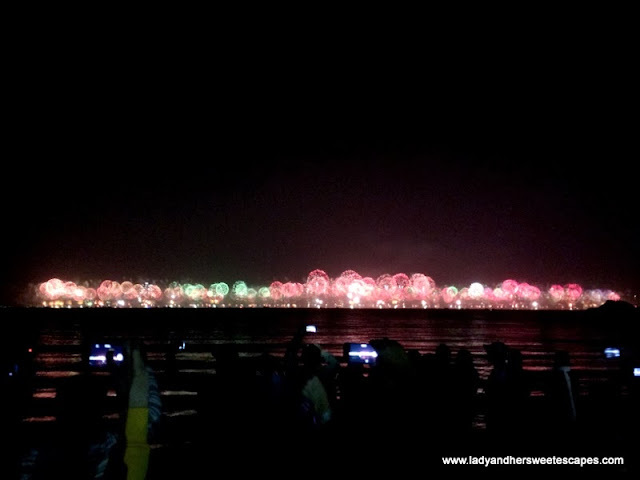 And then the Guinness World Record's largest fireworks display took place! It was 30 minutes late, but it happened! 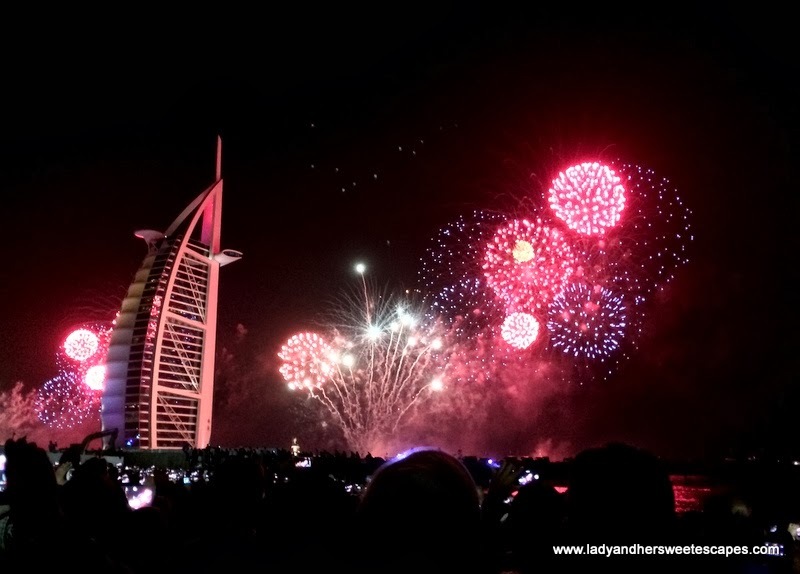 Some spectators who probably thought that Dubai's New Year celebration was over have already left their spot, leaving us with a clearer view of the astonishing pyrotechnics exhibition at The Palm Jumeirah and The World islands. The fireworks caught me off guard; I never expected it to be that wide! I was in a blissful state of shock that the only blog-worthy photo I got doesn't even do justice to what I have really seen. I want you to feel the major goosebumps too, so I'm sharing Dubai Media's YouTube video down below! With that extraordinary start, I guess I am bound to have an extraordinary 2014! I'm looking forward to more record-breaking events, looking down to see how much I've grown, looking up to thank the Lord for all the blessings! Happy 2014 everyone! Lovely photos! Happy new year. Wishin' you a very happy 2014! Beautiful pictures! Happy New Year! Happy New Year! I bet the fireworks are spectacular!!! Spectatuluar! Congratulations Dubai for the new world record! Great start for this amazing city. Happy New Year! Now, I'm wondering what's next for this awesome city. It is!! I was stunned when the fireworks at The World islands went off. I saw the entire length of Dubai's fireworks display on TV! All of us, including my little boy, were astounded by the fireworks. I'm sure you were even more astounded when you saw it personally! Yes, it became one of my memorable experiences in the UAE. I saw this on youtube and I too was amazed. Happy 2014 and looking forward to your food and travel posts! This city is definitely obsessed with superlatives! Amazing! :) Happy New Year, Janz. Happy New Year! The fireworks display are really spectacular. I saw in the news that it was the longest fireworks display in the record. 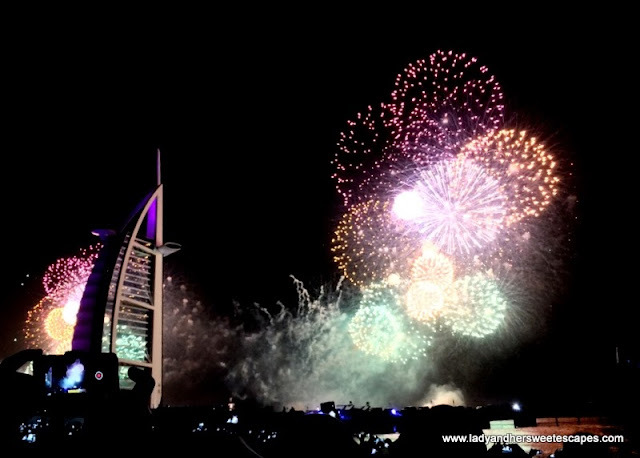 As usual, Dubai made the world scream "wow" again. Happy New Year to you again! More more blessings for 2014!